Home / Programs / Health Care / Allied Health, A.A.S. The Associate of Applied Science in Allied Health degree program is designed for health care professionals with a certificate or coursework in an allied health care concentration. Our program provides health care professionals with complementary skills in critical thinking, problem solving, and contemporary issues, allowing them to expand their knowledge base to be successful and advance in their chosen career field. A student can anticipate out-of-class activities that equal about two (2) hours for every one (1) hour of lecture, and about one (1) hour for every one (1) hour of lab. Core content may be transferred in from any of several health-related programs. 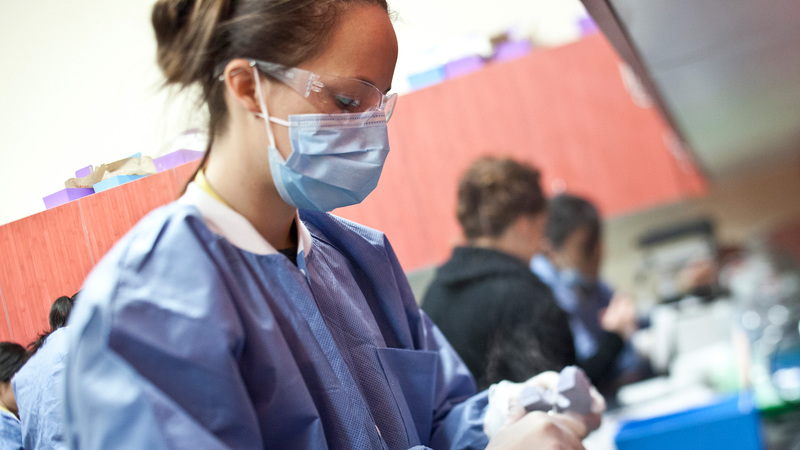 Upon successful completion of the program (see graduation requirements section of the catalog), students could enhance an existing allied health career, seek, or obtain entry-level employment in an allied health related field. Must have 54 quarter credit hours in an allied health care concentration or be a graduate of an allied-health related field program (i.e., Medical Assistant, Dental Assisting, Medical Office Administrative Assistant, Pharmacy Technician, Veterinary Assistant, etc.). Certificate/diploma or coursework must be completed at an accredited institution recognized by the U.S. Department of Education or the Council for Higher Education Accreditation (CHEA) and confirmed with official transcripts. Describe and demonstrate effective supervisory and management skills. Use critical thinking and problem solving skills to explore solutions for specific workplace concerns and contemporary issues. Demonstrate written and oral communication skills in maintaining interpersonal relationships and communicating effectively in a professional office environment. Describe the purposes and intents of key federal, state and local health care policies. *This program is offered online through Charter College Vancouver for non-Alaskan residents and through Charter College Anchorage for Alaskan residents. For Alaska residents, this program is offered through Charter College, Anchorage. For non-Alaskan residents, it is offered through Charter College, Vancouver.